This MicroSDHC cards offer higher storage for more music, more videos, more pictures, more games more of everything you need in today’s mobile world. The micro SDHC card allows you to maximize today’s revolutionary mobile devices. 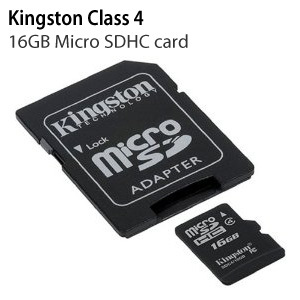 Kingston’s microSDHC cards use the new speed “class” rating of Class 4 that guarantee a minimum data transfer rate of 4MB/sec. For optimum performance with devices that use microSDHC. Kingston’s microSDHC cards use a speed “class” rating that guarantees a minimum data transfer rate for optimum performance with devices that use microSDHC. I purchased this product in favour of the SanDisk microSDHC 16GB Card purely because it happened to go up in price as I was about to purchase it. I do not regret my decision. Kingston is a very reputable brand which has been in the memory business for many years and as such know exactly what they're doing. My package arrived in two days using Royal Mail 2nd Class shipping and was surprised by the improvements in packaging. It came in a small, cardboard envelope with no bulky shrinkwrap. Good riddance to it, I say. The card itself is in a small protective case, along with a microSD -> SD adapter, an unexpected but appreciated addition. It took 27m 59s to copy my 10.8GB worth of media to the card. This averages out at around 6.43MB/s write speed, which is amazing considering the card itself is smaller than my thumbnail. I am very impressed with this card and indeed the seller. Would buy again and recommend to all!